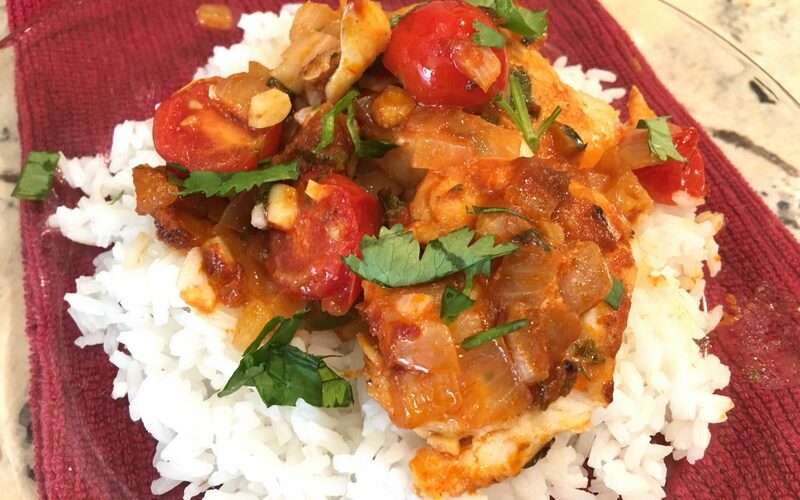 Connecting with new friends is as easy as this Creole Cod recipe. He was intimidated to come cook with us. The last time (and only time) he tried to cook was for a friend, and the meal was not good. Well, who is really good at anything on the first try? The secret is to not give up and consider each attempt practice. I’ve been cooking for many years (decades) and I still think I am just trying things out. With each recipe my confidence grows and so will yours! These 2 jokesters had me laughing nonstop while we made this Creole Cod recipe. This dish was yummy! But the connections and new friendships we were building was the highlight of the day! It’s easy to see how the kitchen brings people together, and like anything else, cooking takes some practice. Franz has become a Connecting Kitchen fan for sure with a new outlook on cooking, and fish, as you can see in the video below. 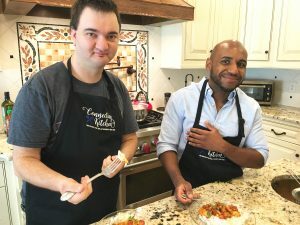 While we are busy building confidence in the Connecting Kitchen, Coach Franz helps young men build their confidence in social situations. He reminds us that social skills are also something that we all need to learn. For some it is easier than others, but guidance from this coach, a man who has taken the journey from shy, introverted and angry to positive, confident, and outgoing, can turn it all around. This was so interesting. I never thought of social skills as something you had to practice. Makes sense though. 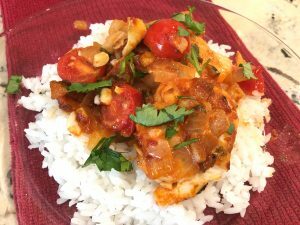 We made this Creole Cod which is typical of the Caribbean Island style of cooking. Fresh fish topped with lots of fresh and flavorful ingredients — tomatoes, garlic, onions, cilantro, jalapeños, fresh thyme and a splash of lime. Since Franz is half Haitian (the other half San Salvadoran) I thought this was a nice way to honor his heritage and his family. He was nervous about cooking again after his first try was a flop. He was further intimidated by the fish recipe I chose because he didn’t really like fish. But he was up for the challenge and even surprised himself by how much he enjoyed making this meal. Making delicious food doesn’t have to be difficult, it just takes practice. Building confidence, relationships, and healthy bodies one recipe at a time. Everything in life is a practice, practice, practice! Pat cod fillets dry and place them in a rimmed dish. Season with salt and pepper. Squeeze juice from the lime over the fish. 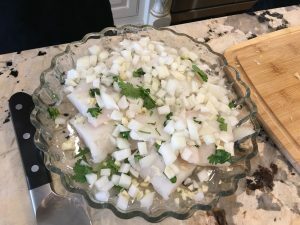 Cover the fish with the chopped onions, garlic, chopped jalapeño pepper, cilantro, and thyme. Let sit for 30 minutes. Remove the fish from the marinade saving the marinade. Heat a non-stick frying pan over medium-high heat. Add the avocado oil. When the oil is hot, add the tomato paste and the marinade with the onions, garlic, and jalapeños to the pan. Stir for a few minutes to blend and to cook the onions and peppers. Add the cherry tomatoes and cook while stirring until they are wilted. Add the fish to the pan, moving the tomato mixture to one side of the pan. Sear the fish on one side for 2 minutes. Flip it over and place the fillets on top of the tomato mixture. Add water to the pan to make a sauce. Cover the frying pan with a lid and let cook a few more minutes until the fish is cooked through. Serve over cooked rice.